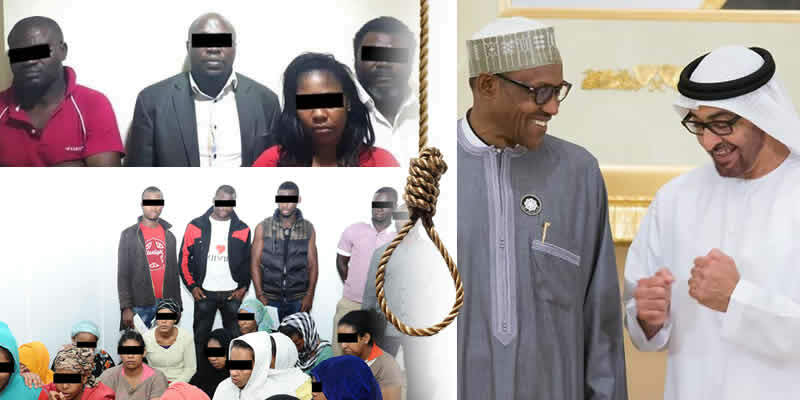 Home Current Affairs FLASH: 23 Nigerians On Death Row In Saudi Arabia! 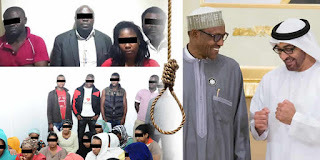 FLASH: 23 Nigerians On Death Row In Saudi Arabia! News have it that are about 11 other persons serving various jail terms for drug trafficking in the kingdom while others are facing trial and following news, a Nigerian woman, Kudirat Adeshola Afolabi, was beheaded in the kingdom for drug trafficking. It was revealed that the late response of the Ministry of Foreign Affairs to a memo from the Nigerian Consul-General, Ambassador M.S. Yunusa, is believed to have contributed to Afolabi’s execution and according to reports, the Consul-General wrote twice to the Minister of Foreign Affairs, Chief Geoffrey Onyeama, on December 3, 2018 and February 6, 2019, raising the alarm over the plight of Nigerians in Saudi Arabia and the drug syndicate operating from the Kano International airport. The envoy alleged that the syndicate in cahoots with greedy airline officials at MAKIA were checking in extra bags containing prohibited drugs. The memo states: “Furthermore, it is with humility that I bring to the Honourable Minister‘s knowledge that, sadly, there are a number of Nigerians arrested for alleged drug related offence who are currently in detention at Dhahban Prison (Male Section) and Madina Prison (Male & Female Sections). Mission was unable to gain Consular access to them as the host authorities have flatly refused to grant permission for such despite several requests to that effect. “Following the outcome of investigations carried out by both the NDLEA and the Nigeria Police (Kano State Command) the Honourable Minister may wish to note that: “There exists a criminal syndicate collaborating with greedy officials of some airlines at MAKIA, notably Ethiopian and Egyptian Airlines, who connive to check in drug-laden bags, using passenger’s particulars without their consent or knowledge; “Nigerian victims of the activities of these criminal gangs were arrested and detained in the Kingdom of Saudi Arabia for drug trafficking offences they did not commit; “The outcome of investigations by the Nigeria Police and NDLEA absolved these victims of complicity in the crime of peddling drugs into the Kingdom. The investigations further established beyond reasonable doubts that the victims were unaware of the drug-laden baggage that were checked in bearing their particulars by unknown persons at MAKIA, Kano; “All the suspected culprits had been apprehended and a case of criminal conspiracy, breach of trust and drug trafficking has been established against them, hence, they were arraigned at the Federal High Court, Kano; “There are 24 Nigerians who were condemned to death between 2016 2018 for drug trafficking in contravention of the Kingdom’s Narcotic and Psychotropic Substances Control Law issued under Decree No. M/39 dated 8/7/1428AH; “There are 12 Nigerian women currently serving various jail terms at Dhahban prison for drug smuggling. a) Halimat Oyebanjo Oyaya – 10 years (b) Sherifat Shawni – 4 years (c) Limata Ahmad – 10 years (d) Halimat Isah – 5 years (e) Olubumi Adejarani Olaniyan – 10 years (f) Omobolanle Funke – 15 years (g) Nuratu Bolanle Yusuf – 15 years (h) Maryam Ibrahim Tanko – 7 years (i) Rahma Abdulkarim 20 years (j) Nuratu Yusuf Abike – 20 years (k) Bolaji Kehinde – 10 years (I) Yasirat Abolanle Salau – awaiting trail. The Consul-General gave insight as to how a syndicate had infiltrated the security in Kano to perpetrate drug trafficking. His memo drew the minister’s attention to “a frightening development that portends grave danger to passenger travelling to the Kingdom of Saudi Arabia through Mallam Aminu Kano International Airport (MAKIA), Kano.” “It has emerged that some criminally minded individuals working in cohort with greedy airline officials at MAKIA, have perfected the art of checking in extra bags containing prohibited drugs, particularly Tramadol, using the particulars of innocent passengers and baggage tags presumably assigned to such passengers travelling to the Kingdom. Regrettably, this contemptible act exposes innocent Nigerians to high risk of losing their lives,” the memo said. “As you are aware Your Excellency, drug trafficking attracts capital punishment in Saudi Arabia. It is, therefore, imperative that urgent steps are taken to checkmate the activities of these miscreants. “Certainly, failure to do so would be tantamount to allowing innocent Nigerians to face death sentences for crimes they did not commit. “In the same token, seven other suspects, namely, Yusuf Isa Ahmad, Shaba Umaru, Diwawu Mustapha, Shafiu Musa, Murtala Muhammad, Musa Haruna and Hajiya Gawure Abba Aji were also arrested and charged to court with criminal conspiracy, breach of trust, and drug trafficking. They were also accused of tagging additional drug-laden baggages and falsely linking same to Messrs Bashir Usman Sani and Amdani Salisu Maikasuwa. Again, Messrs Rabiu Mahmud Sani and Anthony/Johnson as well as Mrs. Celestine Emanuel Yayok were also charged with fraudulency tagging and exporting a bag containing psychotropic drugs suspected to be Tramadol using the passport details of Ibrahim Ibrahim Abubakar Ibrahim. “Furthermore, it is noteworthy to state that consequent upon the Mission’s relentless efforts through several notes to host Ministry of Foreign Affairs (Makkah Region Branch) and ceaseless interactive sessions with the officials of Saudi Department for combating Drugs, Food and Drug Administration as well as the offices of the Public Prosecutor, Makkah and Madinah Regions, Messers Bashir Usman Sani, Amadani Salisu Maikasuwa and Ibrahim Ibrahim Abubakar Ibrahim have all been released on 25th October, 2018 and 25/1/2019 respectively. The Consul-General then gave five recommendations to the Minister of Foreign Affairs, including the need to seek clemency for innocent Nigerians held for drug trafficking in Saudi Arabia.